Learn about the Tristate Medical Reserve Corps. Tristate Medical Reserve Corps (TMRC) is part of a national network of local groups of volunteers committed to improving the public health, emergency response, and resiliency of their communities. TMRC includes 11 MRC units from Southwest Ohio, Northern Kentucky and Southeast Indiana. TMRC focuses on strengthening the public health infrastructure by preparing for and responding to natural or man-made disasters and/or public health emergencies in the community. 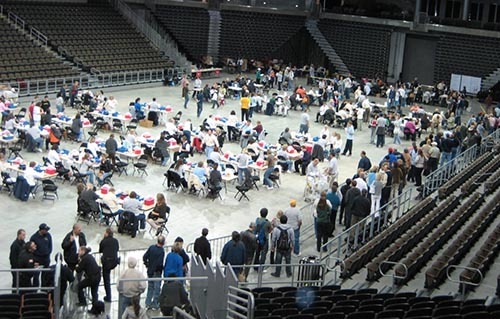 In 2010 during the H1N1 influenza response, the Northern Kentucky MRC responds to assist in a large scale vaccination clinic at the Bank of Kentucky Center. Honor the community-based nature of the MRC and recognize the spirit of volunteerism. Seek opportunities to develop meaningful initiatives that support community medical and public health volunteerism and service. Maximize the potential to learn, and leverage relationships and assets to the fullest extent. Embrace collaboration and work collectively to achieve a mission. Accept and respect the cultural identity of all.